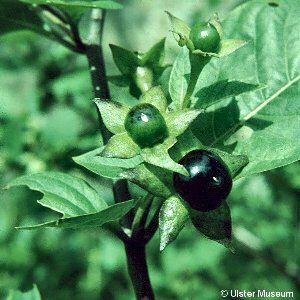 A highly poisonous plant of the nightshade/potato/tomato family (Solanaceae) which contains many poisonous species, some of which are also sources of medicinally valuable chemicals called alkaloids. 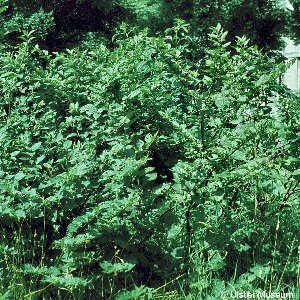 The particular alkaloid produced by deadly nightshade is atropine, which has several uses in medicine. The rather dingy flowers of this plant are followed by rather luscious-looking (but deadly!) berries of an almost black colour when ripe. This plant is probably an ancient introduction into Ireland and is very rare in Northern Ireland, occurring only around one part of south Belfast. 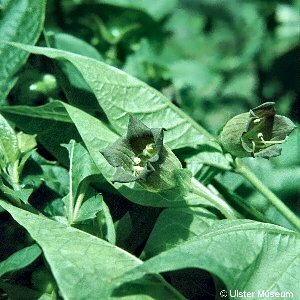 All names: Atropa belladonna L.